Dan Mingori and Nate Greenberg's Backcountry Skiing California's Eastern Sierra brings a much-appreciated splash of color to the small family of dedicated Sierra backcountry skiing guidebooks. The Mingori-Greenberg book is the first to employ full-color photography throughout, including route overviews, action shots in tight couloirs, and memorable artistic landscape work. The photography adds a fresh, vibrant dimension to the book, and is compelling enough on its own to make this an essential addition to the California ski mountaineer's collection. As for the rest of the book, it is admittedly a bit uneven, as might be expected in a hot-off-the-presses first edition—but don't let that stop you from putting in your order. Backcountry Skiing California's Eastern Sierra focuses its attention exclusively on the Mammoth backcountry and neighboring Bishop and Tioga areas. It may seem odd to find an "Eastern Sierra" guidebook in which the range exists only between South Lake and North Peak, but the advantage of this approach is an unprecedented level of detail. Here at last are the names and locations of all the eclectic Dana Plateau lines, from the Powerhouse Chutes to the Cocaine, Ripper, Third Pillar chutes and beyond. Here also is a richly detailed look at many heretofore unknown but outstanding ski peaks in the Mammoth and June areas. The authors may not drive far from home, but where they have traveled they share route information with a unprecedented generosity (enough so, no doubt, to easily vault themselves atop the Keep-the-Sierra-Secret clan's most wanted list). The authors incorporate a new self-devised rating system to handle the usual difficulties in listing expert and beyond descents: a "Consequences & Exposure" rating that mirrors the Class 1-5 climbing system. I find the system useful enough to stick. It is simple, easy to visualize, and easy to understand. 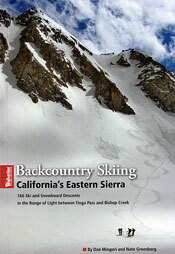 If you are looking for CE 4 and 5 skiing, Backcountry Skiing California's Eastern Sierra does not play coy. The authors fearlessly list fabulously dangerous routes on Red Slate Mountains's northeast face as well as a hanging snowfield of death in the Tioga Region. Somewhat confusing, on the other hand, is the book's graphic layout and design. Chapter, photo, and section headings look alike and can all appear clustered together on the same page, such that it is not always clear whether the text you are reading belongs to one peak or another. Additionally, the level of development of the book's sections varies a great deal. Some sections are outstanding. Others suggest that the authors were running out of time or energy. As mentioned, this is a first edition, and the authors have made clear that they plan improvements (let us also hope for subsequent volumes exploring other parts of the range). Despite these minor issues, Backcountry Skiing easily deserves a place on your bookshelf. Its scope may be limited, but its detail is unmatched.